One of the things you see a lot in a Pre-Calculus class is simplifying Difference Quotients, but what is a Difference Quotient? Well let's start with a graph of a function just an arbitrary function y=f of x and lets pick a point on the graph, so let's call this x. If this x coordinate if this is x then the coordinates of this points are going to be x, f of x. And let's say we pick another point maybe a little to the right say h units to the right and call it x+h. Then the coordinates of the point with this x coordinate are going to be x+h f of x+h. Now this distance here is just going to be h right the horizontal distance between x and x+h, this distance will be the difference in the y values f of x+h and f of x that's f of x+h-f of x. Now a Difference Quotient is this thing divided by this, it's literary rise over run. It's the slope of the line that connect these two points and that's a secant line. So what the Difference Quotient actually represents is the slope of a secant line so f of x+h-f of x over h is slope. Now let's calculate one of these Difference Quotients and by the way the name kind of makes sense these are differences and there's a Quotient. Let's calculate one of these for a simple function f of x=3 minus one quarter x, alright we start with f of x+h. Just a little uh exercise with function notation f of x+h is going to be f of x with x+h plugged in for x. So 3 minus one quarter of x plus h, and that's going to be 3 minus one quarter x minus one quarter h. So my Difference Quotient f of x+h minus f of x over h will be f of x+h this quantity 3 minus one quarter x minus one quarter h minus this quantity f of x and I'll use parenthesis cause I'm going to have to distribute this negative sign 3 minus one quarter x all over h.
Now I'll distribute the negative sign I get minus 3 plus one quarter x and over here I'll get 3 minus a quarter x minus a quarter h all over h, and you see that there''s going to be some cancellation. The minus one quarter x and the plus one quarter x cancel and the 3's cancel and you're left with negative one quarter h over h and that's negative one quarter. So the Difference Quotient simplified to negative one quarter but what does that represent? Remember this is going to be a line 3 minus quarter x a line it might look something like this. No matter what values for pick for your x and your x+h the slope of this line is always going to be negative one quarter, so you'll always get one quarter for a difference quotient that involves a linear function. 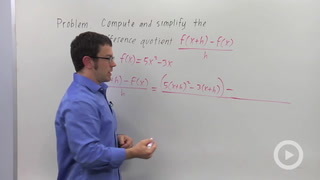 But in general difference quotients can simplify to much more complicated expressions. 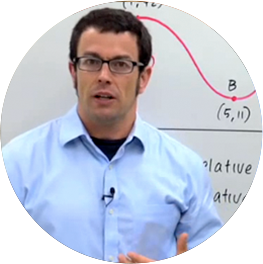 Now they're really important difference quotients are really important in Calculus, and that's why we calculate them so many of them in pre-calculus. So wait and see how important they are they're used to help us define the derivative.